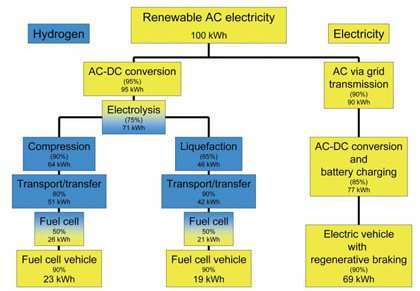 This chart compares the useful transport energy requirements for a vehicle powered from a hydrogen process (left) vs. electricity (right). Image Credit: Ulf Bossel. In a recent study, fuel cell expert Ulf Bossel explains that a hydrogen economy is a wasteful economy. The large amount of energy required to isolate hydrogen from natural compounds (water, natural gas, biomass), package the light gas by compression or liquefaction, transfer the energy carrier to the user, plus the energy lost when it is converted to useful electricity with fuel cells, leaves around 25% for practical use — an unacceptable value to run an economy in a sustainable future. Only niche applications like submarines and spacecraft might use hydrogen. While scientists from around the world have been piecing together the technology, Bossel has taken a broader look at how realistic the use of hydrogen for carrying energy would be. His overall energy analysis of a hydrogen economy demonstrates that high energy losses inevitably resulting from the laws of physics mean that a hydrogen economy will never make sense. “The advantages of hydrogen praised by journalists (non-toxic, burns to water, abundance of hydrogen in the Universe, etc.) are misleading, because the production of hydrogen depends on the availability of energy and water, both of which are increasingly rare and may become political issues, as much as oil and natural gas are today,” says Bossel. Even though many scientists, including Bossel, predict that the technology to establish a hydrogen economy is within reach, its implementation will never make economic sense, Bossel argues. “In the market place, hydrogen would have to compete with its own source of energy, i.e. with ("green") electricity from the grid,” he says. “For this reason, creating a new energy carrier is a no-win solution. We have to solve an energy problem not an energy carrier problem." In his study, Bossel analyzes a variety of methods for synthesizing, storing and delivering hydrogen, since no single method has yet proven superior. To start, hydrogen is not naturally occurring, but must be synthesized. Also, hydrogen is not a source of energy, but only a carrier of energy. As a carrier, it plays a role similar to that of water in a hydraulic heating system or electrons in a copper wire. When delivering hydrogen, whether by truck or pipeline, the energy costs are several times that for established energy carriers like natural gas or gasoline. Even the most efficient fuel cells cannot recover these losses, Bossel found. For comparison, the "wind-to-wheel" efficiency is at least three times greater for electric cars than for hydrogen fuel cell vehicles. Another headache is storage. When storing liquid hydrogen, some gas must be allowed to evaporate for safety reasons—meaning that after two weeks, a car would lose half of its fuel, even when not being driven. Also, Bossel found that the output-input efficiency cannot be much above 30%, while advanced batteries have a cycle efficiency of above 80%. In every situation, Bossel found, the energy input outweighs the energy delivered by a factor of three to four. This fact, he shows, cannot be changed with improvements in technology. Rather, the one-quarter efficiency is based on necessary processes of a hydrogen economy and the properties of hydrogen itself, e.g. its low density and extremely low boiling point, which increase the energy cost of compression or liquefaction and the investment costs of storage. Economically, the wasteful hydrogen process translates to electricity from hydrogen and fuel cells costing at least four times as much as electricity from the grid. In fact, electricity would be much more efficiently used if it were sent directly to the appliances instead. If the original electricity could be directly supplied by wires, as much as 90% could be used in applications. To Bossel, this means focusing on the establishment of an efficient “electron economy.” In an electron economy, most energy would be distributed with highest efficiency by electricity and the shortest route in an existing infrastructure could be taken. The efficiency of an electron economy is not affected by any wasteful conversions from physical to chemical and from chemical to physical energy. In contrast, a hydrogen economy is based on two such conversions (electrolysis and fuel cells or hydrogen engines). “An electron economy can offer the shortest, most efficient and most economical way of transporting the sustainable ‘green’ energy to the consumer,” he says. “With the exception of biomass and some solar or geothermal heat, wind, water, solar, geothermal, heat from waste incineration, etc. become available as electricity. Electricity could provide power for cars, comfortable temperature in buildings, heat, light, communication, etc. Citation: Bossel, Ulf. “Does a Hydrogen Economy Make Sense?” Proceedings of the IEEE. Vol. 94, No. 10, October 2006. Thanks from the electric vehicle community for this concise report debunking the hydrogen hype now being used to avoid the inevitable mass production of battery electric vehicles. This article does not take into account hydrogen production from Aluminum. Aluminum is not only a cheap, easy and safe method to produce hydrogen but also acts as the storage medium. This isnt the whole truth. The reason we will, and should, convert water into hydrogen dispite the costs is that a battery powered car isnt capable of riding 300 miles on one charge. Moreover, when it runs out it takes a while to recharge those batteries. Hydrogen doesnt have these problems. Next to the fact that a fuel cell is better for the envoirement then any batterypack hydrogen is easier to refill and with preassurising one can store much more energy on board of a vehicle then batteries. It is nice to hear a different perspective, but I agree that the story is not the entire truth. Half truth at best. Admittedly there are still many technological challenges ahead of the for the "hydrogen" future, but the author fails to point out practically what is the "electron" economy. What is the best way to store "electrons?" Despite its great efficiency, battery has an array of its own problems. Its disposal issue has improved appreciably in past decades, but it is still an pain, not to mention other issues. Other "green" technologies attempting to store energy in one form or the other are still in development and non-commercializable stage. Everyone working in renewable energy pretty much knows that there is no mono-technology future, but a multi-technology supported energy infrastructure in the future. Hydrogen, regardless of where it comes from, provides a reasonable approach to be part of the solution. Whatever the "electron" approach refers to will also be part of this future, not the only solution. You need to be extremely optimistic about future hydrogen breakhtroughs to make long distance quick refill hydrogen transportation possible. Hydrogen has such a low volumetric energy density that it simply cannot be a practical solution to long distance travel. Refilling is also slow; hydrogen needs to be compressed because liquefaction takes too much energy. But compression takes time. You can't speed it up easily because hydrogen is very dangerous, plus it embrittles conventional materials. So you need expensive exotic materials. It's unlikely that this will ever be cheaper than simple batteries. With a similar amount of optimism on the EV side, we can expect ultra caps and super high density nano batteries that go much further and recharge even quicker than the optimistic hydrogen case. Hydrogen is almost a total waste. Bossel is correct to think there are niche applications, and also correct that it's impact on revolutionizing our energy infrastructure is unlikely to be anything more than negligible. 50litres of H2O contains 50*2/18 = 5.556Kg of H2. Therefore energy content of H2 from 50litres of H2O = 141.99MJ/Kg *5.556 Kg = 788Mj or 219KWh. A medium size/performance battery electric vehicle (BEV) needs about 250Wh/mile and achieves about 80% tank to wheel efficiency. A typical car travels about 10,000 miles per year. Therefore if all the energy contained in the hydrogen from 50 litres of water, i.e. 219,000Wh could be utilised at the same efficiency as BEVs use it then, at best this would give about 219,000/250 or approximately 880 miles range. A typical car travels about 10,000 miles per year and at best a H2 powered car would be less than 50% tank to wheel efficient using fuel cells and far less using internal combustion so range will be less than 500miles. All I can say regarding Wooly's posting is that if "50 litres of water would run a car for a year" he's either discovered some new laws of Physics, he doesn't do very much driving ( less than 5% of typical westerner) or he doesn't really know what he is talking about, I'll leave the decision up to the readers. The above arguments for and against seem to focus on hydrogen as a fuel for cars, as does the articles detail. However the article´s titular claim is that a hydrogen economy does not make sense. There´s a big gap there between what is claimed and what is demonstrated. Certainly hydrogen as a fuel for cars is very doubtful for reasons others have explained however road transportation accounts for only about 50% of oil use and oil provides only 40% of global energy so there unsuitability of hydrogen as a road transport fuel deals only with 20% of global energy use. Maritime transportation accounts for 3-6% of global CO2 emmissions (depending on whose figures you use). The objections cited for the road transport fuel cases do not apply to the maritime fuel case. Volumetric and mass energy densities issues are insignificant issues given the low ration of fuel volume and mass to cargo volume and mass. For the same distance between refueling stops is also not an issue. Safety is easily covered as there is already a well developed culture for handling dangerous materials. A partial but significant chunk of infrastruture is effectively already in place: major shipping ports often also have nearby refineries which often have hydrogen production and handling capabilities. Hydrogen as a maritime fuel could be an easy seed from which a wider hydrogen infratructure suitable for energy generation could be developed. From my window I can see bulk carriers refuelling to my left, a refinery and a dirty cool-fired generator to my right and a continent with all the land and sunshine you could want for hydrogen production just a few miles away across the water. This article makes some very questionable assumptions in its analysis. 1) All of the energy used to electrolyze water must come from electricity generated on the grid, and electrolysis is the way all hydrogen will be produced. False. The majority probably will, but chemicals like titanium dioxide reduce that energy when exposed to sunlight, a technology which is being patented as I type. Furthermore, electrolysis is not required for all methods of hydrogen generation, though the remainder generate carbon dioxide. The article claims Mr. Bossel evaluated many ways of producing hydrogen, but I don't see any evidence of this in his other remarks. And last, hydrogen can be generated with solar cells on site. 2) Hydrogen must be transported long distances in pipes to its destination refuel station. Hydrogen is being generated onsite by electrolysis in Iceland. The only things we need to generate hydrogen are electricity, water, and possibly organic compunds, all of which are easily shipped with today's infrastructure. 3) Hydrogen must be stored as a compressed gas or liquid. This is the least likely method of easy hydrogen storage in the future, although it's what we use today. Hydrogen will likely be stored bonded to metals, carbon nanostructures, or ammonia borane, which is easy since it is such a small atom that it takes almost no room in bonded form. The only trouble is getting it to bond and unbond at will, but this is much closer today than in the past. See http://www.rsc.or..._up.asp. 4) People will wait hours to recharge their pure electric car or external, replaceable battery packs will become commonplace. Yeah, and the world is flat. And if you believe that, I've got some magic beans to sell you. On the web link, it won't function unless you remove the period at the end. Oh, never mond, it doesn't like it. Instead, go to fuelcellworks.com's fuel cell news page, and find "Hydrogen storage steps up a gear." That will take you to the page.